We are participating in Athena's Caturday Art Blog Hop. More artsy kitties can be found here. 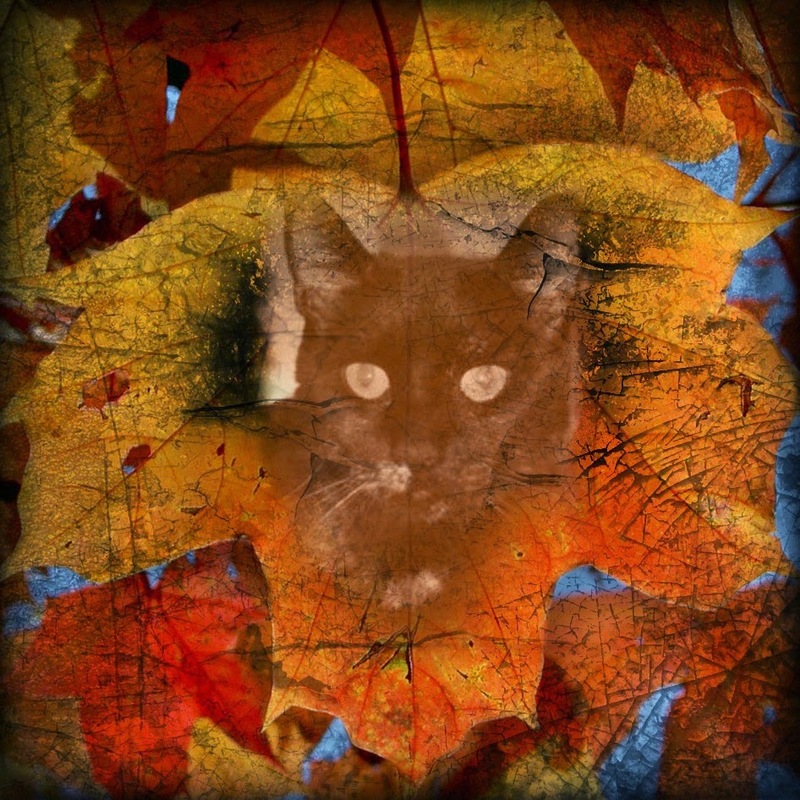 Those are such pretty colored leaves and a lovely art photo...Happy Caturday! Love the wonderful leaves. We don't have fall here! It will be summer for a few more weeks then MAYBE we'll get some winter. And that just means some cooler weather and maybe a little rain. Mom says she envies your beautiful seasons. Truffles, you look perfect hiding in the fall leaves. Lovely leaves, lovely art! Our Mommy is so ready for fall and cooler temps. Very nice photos. Please visit us at 15andmeowing-we are having a contest. Fall is my favourite season, and it is in full swing here in SE England as well. I didn't see any pumpkins yet though. I bet it is just spectacular with the leaves starting to turn into their fall colors. Great Caturday art Truffles. I love the photo of you with the fall leaves. I am wondering where the summer went, I am not sure it arrived yet. The blue in the leaf mosaic is PURRfect! Whoa! We don’t have pink leaves here. Come to think of it, we don’t have leaves with cats in them either. Cool! Truffles looks beautiful! Love the pink leaves too! So you are getting cold already too? Wasn't ready for it quite so soon! That's lovely, Truffles and Melissa! The leaves are just now starting to turn here. We love fall, but not what comes after. LOL. Just beautiful! I sooo love Fall!